Explore the intricacies of the universe, from the comfort of your armchair! Are you fed up with all the petty restrictions living on planet Earth places on you? 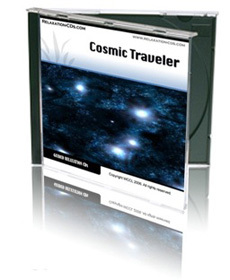 Then let this CD whisk you away on a relaxed, guided tour of the universe! Our visualization will take you on a journey of a billion light years on your very own luxury spacecraft. All you need to do is relax and watch as the stars go by. You’ll see Earth shrinking behind you to become a mere pin-prick in the velvet darkness of space. See the wonders of the planets as they pass by, from ruby-red Mars to the fabulous rings of Saturn. Watch fiery-tailed comets arc towards you, then vanish swiftly in your wake. And all the while the mysterious, cosmic sounds of deep space fill your mind. Leaving our solar system, you travel through the interstellar void to the stars, and beyond them to other galaxies...then onward, ever onward, to the farthest reaches of our universe. What will you find there? Only you can say! And when your amazing journey is complete, the CD will bring you back, safe and sound, to Earth again. You’ll be relaxed, refreshed and revitalized by your incredible journey. What’s more, you’ll have a ticket to return to space any time you like!